Today our star-hopping adventure begins at the Big Dipper in the constellation Ursa Major. 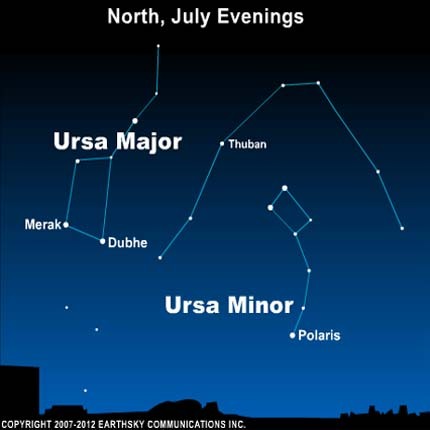 Draw a line through the Big Dipper’s pointer stars – Duhbe and Merak – to locate Polaris the North Star. Polaris isn’t the brightest star in the sky, as is commonly supposed. It is only the 50th brightest or so. Still, Polaris is bright enough to be seen with relative ease on a dark, clear night. 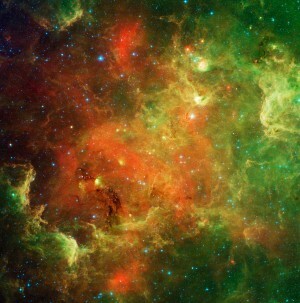 This star is famous not for its brightness but for its location in our sky. It is located above the Earth’s northern axis. Thus, the entire northern sky appears to turn around Polaris. Polaris is noteworthy for another reason. It marks the end of the handle on the Little Dipper asterism, in the constellation Ursa Minor. The asterism is not the whole constellation, but a noticeable pattern within the constellation Ursa Minor the Smaller Bear. Previous Story: Earthsky Tonight—June 30:When is the next meteor shower? Site contents copyright © 2019 Recorder Online	except as noted. All rights reserved. | 86 queries in 2.228 seconds.